Camel ride marrakech. Escape to the desert outside Marrakech for a 2-hour small-group camel ride set among the rugged North African terrain. 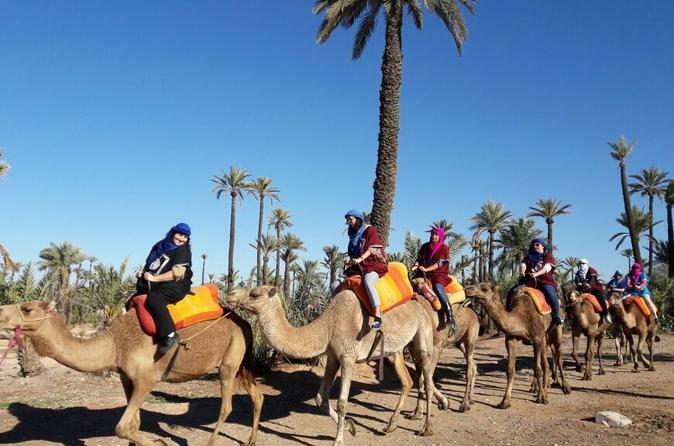 Don your protective head scarf and jump aboard your camel for a ride amidst natural groves of palm trees and the ever-changing light of the desert sky. Then take a break in a Berber village to enjoy some friendly hospitality, accompanied by Moroccan tea and a pancake snack. This small group trip, limited to just 16 guests, also includes air-conditioned round-trip hotel transport, a multilingual guide, bottled water and a protective head scarf for the sun.